We have had so much fun in March with our Bluebonnet cards and classes! 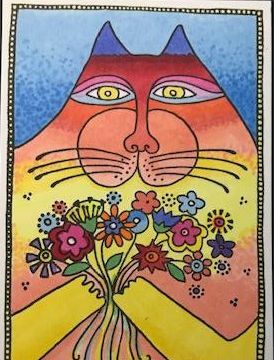 Our First Friday "Coloring with Karen" class in cancelled for April. The next one in is Friday, May 3 at 10:30 am. Call the store to reserve your spot! 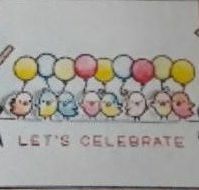 See the class for April 12th to have some coloring fun! 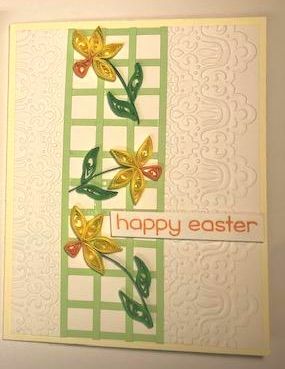 cute Lawn Fawn Reveal Wheel Easter Cards and Easter Quilling Cards on Saturday, April 13. Diane's classes on April 20 use cute Lawn Fawn stamps and dies. Check them out below! They're here! The NEW Graphic 45 collections! Love Notes, Flutter, Bloom, and Kaleidoscope! Look for the displays in the store ! So come and spend some time with us so you can be happy stamping! 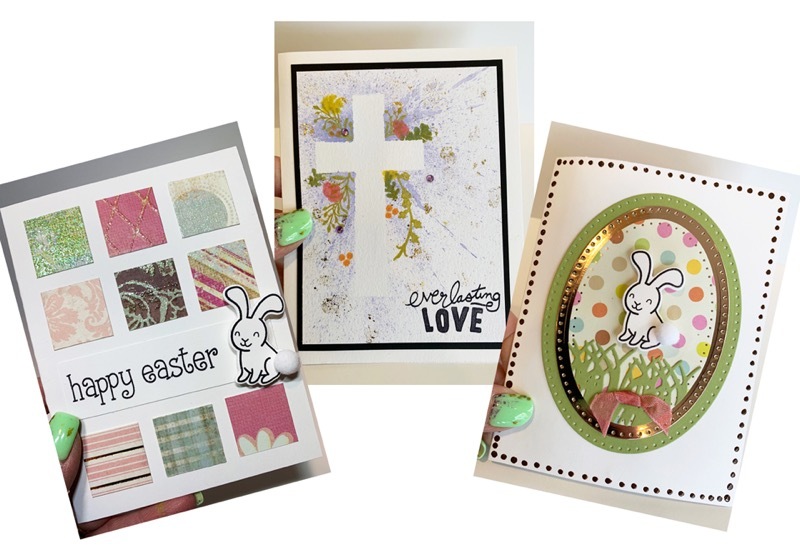 Gorgeous psychedelic Easter colors, playful shapes, Tim Holtz accessories and embellishments galore! Don’t miss this engaging class! These stylized bunnies are so much fun to create with beautiful alcohol inks! 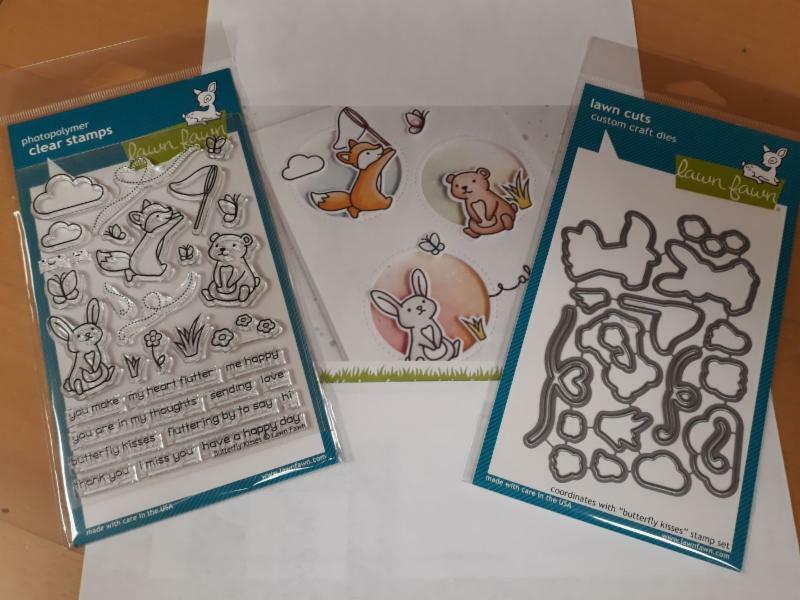 Everyone will receive a bunny template to use for future projects along with coated cardstock. (enough to create 5, yes 5! funny bunny cards). Use your creativity to make them your own - plenty of embellishments will be available. Enamel accents add that special last touch to each card. One of these would look adorable peeking out an an Easter Basket! I hope to see you there! Door prizes, of course! a dry adhesive and a bone folder and colored pencils if you have them. 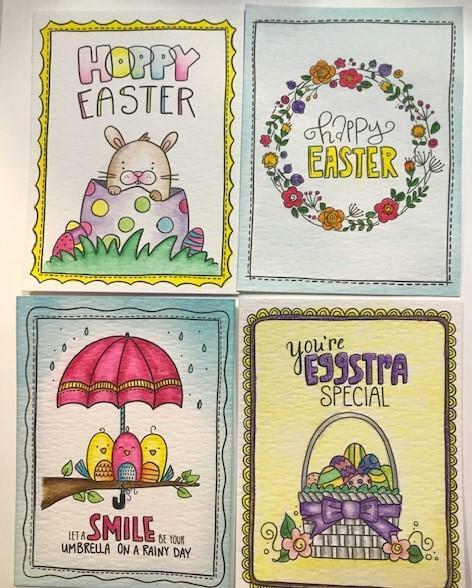 In this class we will create 3 wonderfully unique Easter cards. with different colors, textures and themes! These designs are versatile enough to use for many occasions. I hope to see you there! Door prizes, of course! These watercolor paper panels from Taylored Expressions are perfect for card fronts or tags! with colors of your choice. for these cute card fronts or tags! 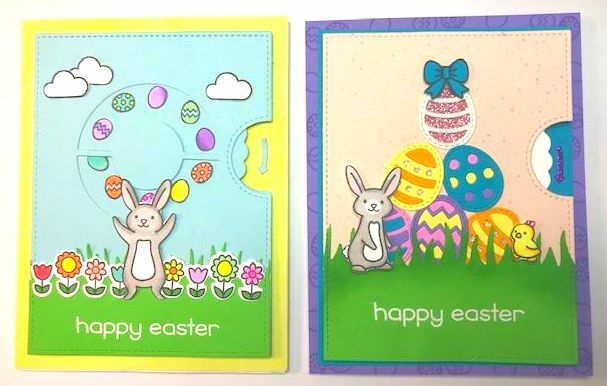 Create two cute cute cute interactive cards from Lawn Fawn using the Reveal Wheel Dies. 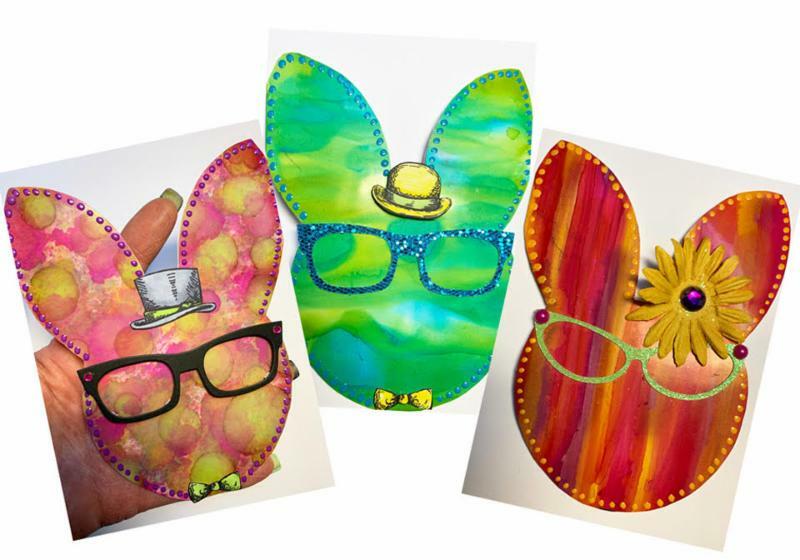 Color your bunnies, Easter eggs and flowers with alcohol ink pens or colored pencils. and how to make your own speckled paper. Put all the pieces together and you have TWO a "eggstra amazing" cards! any quilling tools you may have. There will be several to use at the class. You will be amazed how easy it is to create these two beautiful quilled cards! Shapes you will create for the flowers: teardrops, marquise, triangles, corrugated teardrops, corrugated tight circle, scrolls, and petals with a quilling comb. Join Karen to "get your twirl on" in this fun craft of Quilling! 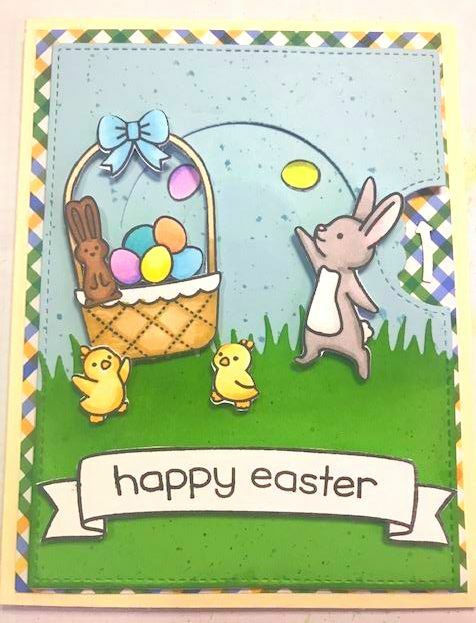 A super cute interactive card with the bunny tossing Easter Eggs in the basket! The Reveal Wheel Cards are easy and fun to put together! 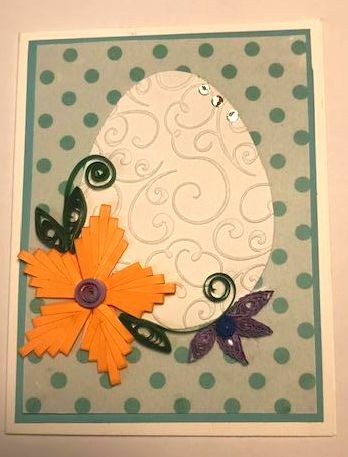 for a quick"eggstra amazing" Easter Card Make-N-Take! 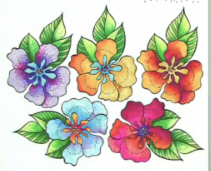 the Lawn Fawn Butterfly Kisses set of stamps and dies! Each card will have a different technique that you can use over and over again! We will also feature different coloring techniques to highlight these butterflies and furry friends! Great to use for any occasion, you will have a sweet time in this class! 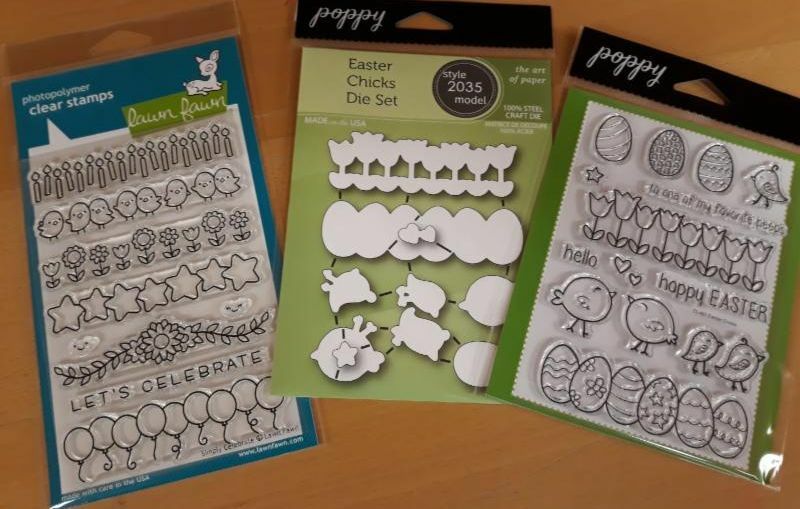 and the Easter Chicks set from Poppy stamps to make four cards using these cute characters. You'd be amazed at what you can do with a line of stamps! and then enhance it with these adorable spring figures! A great time to relax and learn some fun and easy blending techniques. 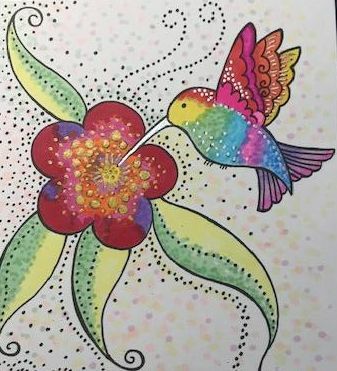 Hints and tips on what kind of paper to use with the different mediums. you'll find that the techniques during this time are easy and fun. This is the perfect time to come try them out! you can also show us on your mobile device.